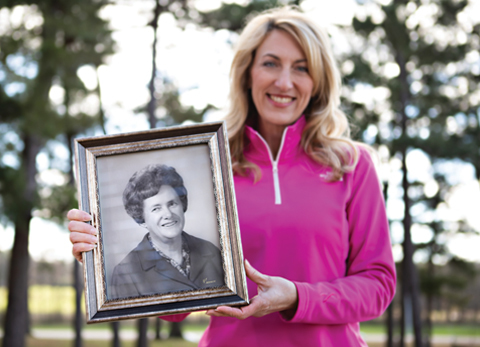 As Jonesboro prepares to host the third annual Northeast Arkansas Susan G. Komen Race for the Cure, organizers, led by 2019 Race Chair Amanda Herget, hope to build on previous years’ successes while continuing to make a lasting impact on the fight against breast cancer on a local level. The 2019 NEA Race for the Cure (RFTC) will take place on April 27 at Centennial Bank Stadium on the Arkansas State University campus and will be accompanied by several other events throughout the weekend. Organizers hope that the more than 4,000 anticipated participants can help raise $350,000 for the nonprofit organization. Herget, who owns Gearhead Outfitters with her husband, Ted, has served as the Friday Night Event chair for the past two years and welcomed the opportunity to step into the role of chair for the 2019 race. “Race for the Cure is something I have wanted to be a part of for a long time,” said Herget. “I’ve always wanted to be involved, but being in Little Rock, it wasn’t convenient. … I’ve had so many people affected by breast cancer, it’s been something I have been passionate about getting involved with and didn’t know how until it started here. Jonesboro’s successful inaugural race took place in 2017. Combined with the 2018 race, the two events raised more than $775,000 for the world’s largest nonprofit source of funding for the fight against breast cancer. Herget says she grew up being aware of the devastating effect of breast cancer from a very young age. “My (paternal) grandmother passed away in ’76, one year before I was born, so even though I didn’t understand what it was, I heard about it from a young age,” she said. “It’s always been something I was aware of. Then, when I was 12, my great aunt was diagnosed and also passed away. There’s not a day my (maternal) grandmother doesn’t talk about her, and she is 89 now. Miller will be recognized at the 2019 race as an honorary survivor, along with Nancy Blackshare of Rector and Kathy Lemmons of Pocahontas. All three own or work in small businesses, a theme that Herget tried to stick to when selecting the honorees. She also tried to include other areas of NEA, which the committee began focusing on last year. Herget says that because the disease is unfortunately so common in NEA, almost everyone has been touched by the disease and is eager to get involved with the foundation and the race. Of the money raised already, $338,000 was granted to local hospitals and clinics to fund mammograms, mobile mammography, treatments, patient navigation, education and more. An additional $112,000 was used to pay for research to find better treatments, drugs and ultimately to find a cure for breast cancer. “Jonesboro and (the) surrounding area is an amazing community of people; in my observation, they are passionate about caring for one another,” said Treadway. “The Northeast Arkansas Race for the Cure raises money to provide care to people in Northeast Arkansas who need assistance with their breast health. And, with Northeast Arkansas being the area of the state with the worst late stage diagnosis and mortality of breast cancer, Komen Arkansas is incredibly fortunate to have a strong group of volunteers who are committed to raising the funding that will stay in your community, and also contribute to research to find better treatments and a cure for breast cancer. Stepping up to sponsor RFTC are presenting sponsor Barton’s and Surplus Warehouse, founding sponsor St. Bernards Healthcare, elite sponsors A-State and NEA Baptist Hospital and Auxiliary and many others. The committee is largely responsible for event’s early success, as well. Treadway and Herget are joined by Komen NEA Race Director Nancy Elphingstone, Komen Arkansas Board Member Julie Isaacson and former Race Chair Candace Cooper, along with a dedicated committee that includes Communication Chair Audrey Poff, Sponsorship Chair Nancy Elphingstone, Pink Village Chairs Renea Fry and Beth Damphousse, Race Route Entertainment Chairs Renee Harmon and Jenny Keller, Registration Chairs Tammy Lee and Janice Kroeter, Pink Pasta Party Chair Whitney Williams, Field Stage Chair Hidda Spencer, Team Fundraising Chair Ashley Spencer, Race Operations Chairs Courtney Griffin and Kody Griffin, Survivor Breakfast and Parade Chairs Alicia Storey and Kara Fowler, Volunteer Chair Toni Inboden, Pink Pump Run Chairs Hayden Griffin and Ashlyn Cornell, Social Media Chairs Meredith Cook and Madison Tyer, Pink Prowl Chairs Lindsey Ford Wingo and Brandon Stevens, Start Stage Chair Christie Matthews, Medical Assistance Chair Dr. Bhavesh Joshi, Big Wig/Honorary Survivor Chair Lori Fitts and Graphics Chair Anna Long. Herget chose her longtime friend, pharmacist Kara Smith, to serve as the honorary chair because of her in-depth work with breast cancer survivors. Together, all those involved have planned a series of events and celebrations that coordinate with the race and will all work together to battle breast cancer. Friday night’s festivities will again include a Pink Prowl, Pink Pasta Party and the renamed Pink Pump Run, and prior to the race on Saturday morning, there will be a breakfast and parade for survivors. A new addition to the 2019 RFTC event will be a VIP area in the north end zone for top fundraisers, top survivor fundraisers and top teams. Herget says it will be a way for them all to connect with one another and be recognized away from the large crowd prior to the race.